Meant to mention this in the Legion guide (great work, btw) but there is a mage "version" of the fishing raft - Bipsi's Bobbing Berg. Same vendor, price, and rep. Only shows if you are a mage. Interestingly it is not a toy. I see no mention of Nat Pagle or any sort of fishing rep vendor, A little underwhelming for the Anglers amongst us I would imagine. to purchase things from nat pagle at your garrison fishing shack level 3 you need to be best friends with (although some items only rquire lower rep) as far as i know the only way to get rep with nat pagle is to do the dailies at angler's wharf, as handing in the lunkers gave 0 rep. also, pretty sure the auction house has restrictions in place for selling unique items. furthermore, you claim "every profession" received the new system..archaelogy did not as blizzard wants to retain the whole exploration/lore of that particular profession.. the downside being you can still level it up solely by doing you garrison mine everyday (which btw the garrison no longer gives you mining or herbalism skill, just massive xp) you also have no archaelogy section in your guide. Not only in BfA. I received popups, while fishing in Thunder Bluff. With the changes to fishing do i still need to complete all tiers fit the fishing artifact? I've messed legion fishing to 100 but was wondering do i heed to go neck and do the others for the Artifact fishing pole? Just a quick FYI. You can only have 1 of the Great Sea Rays in your inventory at a time. About the popup window - are you sure it's not because you're playing a Highmountain Tauren? Their racial is basically that - when getting a food crafting ingredient, you have a chance to get a second one and it shows as a popup window. Thank you for the guide. There is a typo in the table of "Types of Fish". The header says Zuldazar instead Zandalar. Is there any advantage to fishing in schools? I'm level 73 in fishing and I don't see any advantage. How can i max legion fishing now? At 100 and no clue if there's a trainer somewhere. The guy on the island in Dalaran has nothing for me. Went from 0 to 150 Zandalari Fishing in about an hour and a half in coastal waters off Nazmir (going for the mount). Used Chapeau à boire de Nat (+18) and Canne à pêche ornée de joyaux (+13). I've been reading around that once you max fishing, you do not get any more bonuses based on gear. True or no? Has any body tested this? And to add to this guide, since I don't see it anywhere. There is this quest Vol au-dessus d’un nid de mouette which rewards you +1 fishing skill and gear that gives +5 fishing. Where do I start fishing dailies in BFA? Don't know if you missed this or not but Midnight Salmon also seem to have a higher rate of catch from any pool than they do in open waters. They may not have specific pools but higher rate from any other pool works for me. not sure if i'm super lucky or if they did a hotfix but i'm catching at least 1 Midnight Salmon for every 10 regular fish (23/250fish). based on what i do know about econometrics, this would likely suggest a buff in the past few days. I mean, what benefit does higher fishing skill confer? For instance, what will a 150 skill in Kul'tiran fishing do that is better than, say, 1 skill? From what I can see, it's not like it used to be where zones or certain areas are locked away until you reach a specific skill level, or even decrease the likelihood of not catching trash (which, in the past, necessitated the use of special buffs or fishing rods). Is there, actually, some benefit that I just missed somewhere. 400 casts @ Plunder Harbor, 150+21 Fishing skill. What is the best gear available for fishing? 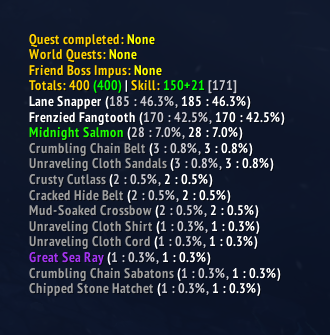 it may be just my luck is really bad, but ever since prepatch hit, catching rare bait in Legion seems almost impossible. Before prepatch hit i remembered i should do fishing pole and made it in two days while cathing all rare baits, (i had skill 800 from pandaren and draenor fishing). I dont know exactl number but i pretty much caught at least one rare bait for one arcane lure. But i think it was more than that. Now BfA is here, and i wanted to skill up my pole, but i have caught more than 1000 fish, and didnt fish up a SINGLE ONE rare bait. I mean that is less than 0.1% drop. Even ^&*!ing invincible has higher change than that, and you need like 20 of these to make another pole. Maybe RNG Gods really hate me, but less than 0.1%! EDIT: immediately after writing this i got 5 lures pretty much in a row. Two of those even from fishing the pools it spawns from using said lure. A section with best in slot +fishing skill would be nice. I got a new pair of boots with +5 fishing Anglin' Art's Sandals. What's the best pole? The best hat? Other slots? Enchants? The maximum bonus Fishing skill for Battle for Azeroth is +78, however, only +68 is practical, as you can not use the Élixir des Entrailles outside WotLK Dalaran, which gives you +10 Fishing when transformed to Tuskarr. It has to be noted that there is hardly any difference between the amount of trash catched between level 150 and level 218. That said, I have no data on Raie de la Grande mer or Saumon de minuit for example, higher fishing could benefit the droprates of these items. But again, I have no data, it might aswell make no difference at all. Blasted Lands (only the desert part; Surwich and The Tainted Lands work just fine). I suspect this will never get fixed considering all the other bugs and breaks BfA brought into existence, so if you're planning on hunting the classic rares, avoid these zones. What am I missing? I'm lvl 67, with a fishing skill of: Classic=300 & Northend=75 and am not getting any more skill-ups. How does one get to 575 skill required by some of the mounts (like the raft)? It seems unlikely that it can be done with lures, hats and poles ad those only add a few points each. The fishing raft can be used by alts without the reputation now (although I think you still need the reputation to acquire it). Alts merely need pandarian fishing level 1 to use it.